* Uncover the secrets of the hilltop village of Volterra, famous for its magnificent sunsets and Etruscan ruins dating back more than 2,000 years. The Romans mined Volterra’s alabaster for sculpting. * Relax by supping a glass of Vernaccia on top of the city walls in the afternoon in San Gimignano, when most tourists visiting the town have disappeared. Vernaccia is a local grape varietal, produced in and around San Gimignano. * Visit beautiful San Quirico and Pienza, both located in picture perfect Val d’Orcia, where you will check into your ‘feature stay’ hotel, a converted 15th century monastery. Welcome to Florence, the cultural capital of Italy and the gem in Tuscany’s crown. No activities are planned until tonight’s group meeting, so you can arrive at any time. If arriving early, be sure to head out and see some of Italy’s ‘outdoor museum’. Perhaps pay a visit to Piazza della Signoria and marvel at the collection of famous statues there. In the evening, meet your trip leader and fellow travellers at a welcome meeting. Meals Included:There are no meals included on this day. After breakfast, walk to the impressive Chiesa di San Biagio, a 16th-century church nestled at the edge of the Montepulciano village walls. Cross through the picturesque valley below, past vineyards, pastel-coloured villas and rolling hills, until reaching the village of Monticchiello. Here, enjoy lunch under the welcome shade of a grapevine canopy. Explore Montichiello’s town walls and stroll through the charming town centre. Return to Montepulciano in the afternoon and enjoy a sightseeing tour of its labyrinthine maze of laneways and imposing defensive walls. The views from the walls across the Tuscan landscape are simply unforgettable.The afternoon will be at your leisure. Perhaps do some shopping in Montepulciano’s classy boutiques. Later on in the afternoon take part in a wine tasting in a local cellar. This morning you will be transferred to the beautiful village of San Quirico, one of the lesser known jewels of Val d’Orcia. You may relax in its beautiful ornamental garden, or simply enjoy a coffee in one of the cafes lining the corso. You’ll then embark on a beautiful walk through the distinctive landscapes of the Val d’Orcia, flat chalk plains interspersed by almost conical hills topped by fortified settlements. It is in this bucolic setting that you will reach the unique spa town of Bagno Vignoni. Here the main town ‘square’ is actually a picturesque ornamental pool built by the Medici family! Cool our heels in the many Etruscan water channels that surround the old watermills just outside of the town centre. This is a truly unique attraction in the Val d’Orcia but unknown to mass tourism. There are several options after the walk to Bagno Vignoni: Avid hikers can opt for a beautiful route all the way to Pienza, or alternatively you can choose to ride in our vehicle to the stunning chapel of Vitaleta. The short walk from here to Pienza, especially in the late afternoon, is one of the highlights of this trip. Arrive in Pienza and enjoy the views from Pienza’s city walls that are quite simply spellbinding. 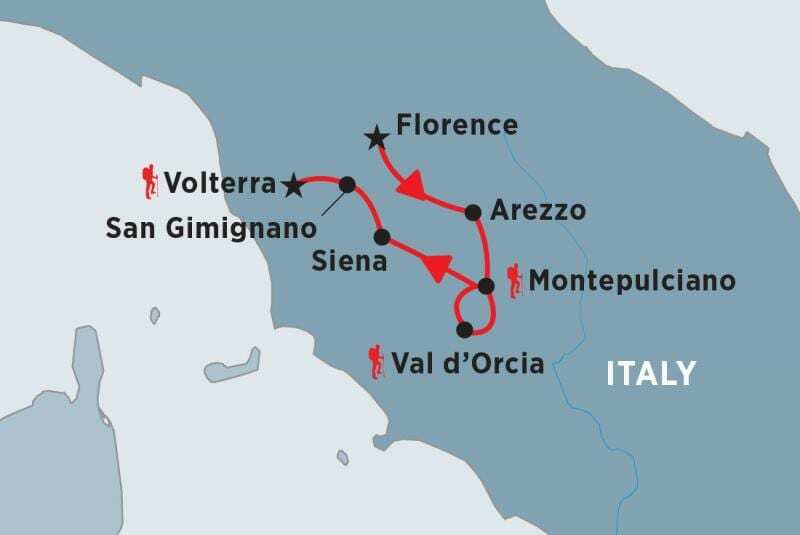 Take time to pause and enjoy the captivating vistas afforded to you, the epitome of Tuscan landscapes rolling expansively before you – burnt orange villas, tightly wound hay bails, meandering country lanes and fields of barley. After arrival you will check into your feature stay hotel, a beautiful monastery converted into a hotel, right in the heart of the Utopian city of Pienza. Enjoy dinner on the premises of the monastery tonight. After a leisurely breakfast set off to the real highlight of this area, and arguably the most beautiful monastery of Tuscany: the beautiful Romanesque church of Sant’Antimo (Abbazia di Sant’Antimo) in a picture-perfect landscape. Here you’ll have the possibility to listen to Gregorian chanting. After an optional lunch depart for the charming village of Montalcino, one of the most stunning hilltop towns of the area. 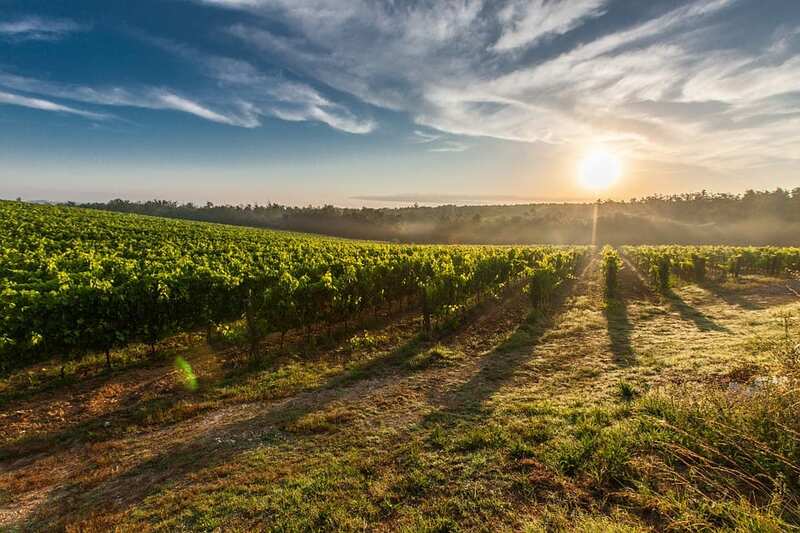 Montalcino, an authentic medieval village dominating the surrounding forests and vineyards, is in fact the capital of the world-famous Brunello wine. Visit the charming old town, stroll along the impressive medieval town walls – and perhaps do another wine tasting in the beautiful setting of the fortress of Montalcino. In the afternoon return to our base in beautiful Pienza. Sit in the garden, relax at the pool or just take a seat in the main ‘Corso’, sip on a local glass of Sangiovese and partake in another fine Italian tradition – the art of people-watching. Your Tuscan adventure comes to an end in Volterra this morning. Before departing, take the time to visit the well-preserved medieval city ramparts or wander through the cobbled laneways.